Throughout the 2007 and 2008 presidential campaign of Barack Obama, he and his team made distinguished assertions claiming that he aimed to refine the nature of the Bush presidency and the way Washington functioned. The overarching theme of change, both on the domestic and international fronts, is what embodied the message of his presidential campaign. In light of this, there was a need for a campaign ad to illustrate his goals as well as create an appeal to the American voters. 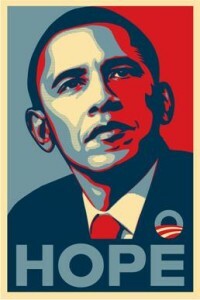 In October 2007, a street artist by the name of Shepard Fairey produced Obama’s widely know ‘Hope’ campaign ad. Through the skillful use of a one-word slogan, the recognizable countenance of Barack Obama himself, and a color palette which reflects that of the American flag, Fairey was able to convey a social realistic-type ad that portrayed Obama’s 2008 optimistic campaign message, persuading the viewer to vote for him. Today, the ad can be regarded as one of the most widely recognized presidential ads, with a plethora of meanings and interpretation. With the conservative tide of America ebbing, Barack Obama saw that the American people wanted to see something new and fresh from the government. In addition, Americans were long run dry from the Iraq War and the combination of George W. Bush’s tax cuts and his imprudent spending left America in a great economic crisis. Obama hoped to change all of this. After announcing his presidential candidacy on February 10th, 2007, Barack Obama and his team set out to mobilize a following, with their primary focus on black and white liberals as well asyoung voters. His strongest opponent, Hilary Clinton, focused her campaign theme on experience, while Obama focused his on change. In a time when the economy was at its lowest point since the Great Depression, the theme of change appealed to the masses in a greater sense. In order to support his theme of change, Obama highlighted the issues of his general election campaign. He promised to “cut taxes for 95 percent of all working families,” “end our dependence on oil from the Middle East,” provide “affordable, accessible health care for every single American,” and “end the war in Iraq responsibly and finish the fight against al Qaida and the Taliban in Afghanistan” (Miller Center). Additionally, Obama was the first Africa-American to run for office in the United States. This being said, it could have been implied that a black president was a progressive idea, moving slowly towards a more liberal and democratic America. With Obama’s objectives clearly stated, he and his team were in need of a presidential campaign ad to abide cohesively with these said amendatory objectives. Barack Obama’s team produced an abundance of positive advertisements that encompassed the theme of his campaign. Words such as “progress,” “hope,” and “change” were all emphasized. The specific ad, which today is considered the most widely recognized presidential campaign ads, is that by street artist Shepard Fairey. It is regarded as “Obama’s ‘Hope’ poster.” This depicts a cartoon-ified portrait of Barack Obama looking up and away from the viewer’s gaze. The colors in which he is depicted in include red, beige, and light and dark blue. The single word ‘hope’ can be found at the bottom of this poster. As was previously stated, this depiction was created to portray Obama’s 2008 forward-thinking presidential campaign. In this advertisement, Barack Obama is the main focus- mainly because he is the only subject or character in the entirety of the ad. He is shown looking up and away from the viewer’s gaze. This can signify that he and his presidential campaign is looking toward the future of America in the hopes of it becoming more progressive and liberal. His expression appears to be serious, however, it is not grave or cold. It can be considered to be optimistic, especially due to the fact that his head is tilted upward. Concerning the color palette of the advertisement, it seems to represent the colors of America: red, white, and blue. Because of this choice of colors, Barack Obama and his objectives appears to be the utter embodiment of the ‘American Dream.’ Not one part of this ad is depicted in its original form, alluding to the fact that the cartoon-ified style of the piece is one which is inspired by the artistic style of social realism. Social realism is an artistic movement in which the artists choose to focus of the hardships of everyday life and social issues facing the public. Although this poster advertisement does not depict specific hardships of everyday life, the depiction of Barack Obama himself in the ad represents his fight to reverse the failed workings of the Bush administration and to improve the standard of living for the whole of the American people. One word, ‘hope,’ can be seen at the bottom of this poster advertisement. The one-word statement is in block, capital letters with a simple font that’s not overly fancy. This stylistic choice manifests the quote “short, sweet, and to the point.” Also, the word is shown in light blue lettering. When shown in marketing and advertisements, the color blue indicates confidence, reliability, and responsibility- all of these adjectives, in fact, can relate back to the 2008 Obama campaign in some way. Also, the colors blue relates to one-to-one communication rather than mass communication. This is essential to the Obama campaign, because is seen to be representing the everyday American. The word ‘hope’ itself can say a lot about the 2008 Obama campaign. In the wake of economic turmoil, the American people were desperate for a change in policy. With Obama now in the running as a presidential candidate, Americans could now hope for a better future for them and their children. Other words, such as ‘progress’ or ‘change’ could also be seen in replacement on different versions of the ad. Obama did not singly stand for change in governmental policy, he stood for change in the fight for equality of race in America. By voting for him for president, progress towards the fight for racial equality became prevalent and the idea of change for a more accepting and racially diverse society was manifested. The 2008 Obama administration succeeded with the use of the ‘Hope’ poster advertisement in their campaign mainly by alluding to the ethos and pathos of the public. Throughout the course of history, American presidents have mainly been white, middle-to-upper-class men. However, this commonplace is quickly disproved in the ‘Hope’ poster, which clearly depicts Barack Obama’s racial difference. Ethos is stimulated through a viewer’s realization that Obama, depicted in the poster, is the nation’s first African-American man to run for president. In a time when America was driven by white supremacy (and still is today), the ethical reasoning for electing a black president seemed almost too obvious. By voting for Obama, you were voting for the racial diversification of America. After the audience’s comprehension of the fact that the poster was ethically progressive, pathos is capitalized on when a viewer, especially those of a racial minority, makes the realization that Obama represents the changing of social or professional status. When young Barack Obama was growing up, he was the subject of much racial hate, especially due to the fact that he was the only black boy in school. Many racial minorities can relate to this, because they have been in that same situation at some point in their lives. The audience feels a certain call to action when the understanding of the ethos and pathos of this poster advertisement is achieved. In this case, the call to action would be to vote for the potential first African-American president that the nation has seen. Due to the influential character of the Obama ‘Hope’ poster, along with many other ads, Barack Obama was elected president on November 4th, 2008. He defeated his Republican adversary, John McCain, by 53 percent to 46 percent in the popular vote. Many of his supporters were young voters, or minority groups. By completing the simple act of voting, these congregations of American society now saw that they could have a voice in government policy-something they didn’t believe they possessed previously. In addition, President Barack Obama was elected again in the 2012 midterm election. He won 52 percent of the popular vote, compared to Mitt Romney’s 47 percent. Because of these specific political advancements that occurred subsequent to the presentation of the ‘Hope’ poster advertisement, progression has been made toward the fight against racial inequality not only in America, but across the globe as well. Due to its use of character, colorization, and word choice, Barack Obama’s ‘Hope’ poster achieved the goal of generating support from the popular vote with an optimistic tone while alluding to the ethos and pathos of its audience. “Campaign Themes, Strategies, and Developments.” The 2008 Election:. N.p., n.d. Web. 5 Dec. 2015. “Center for Public Integrity.” Center for Public Integrity. N.p., n.d. Web. 4 Dec. 2015. “Color Meanings in Business.” Empowered By Color. N.p., n.d. Web. 7 Dec. 2015. “Miller Center.” Barack Obama: Campaigns and Elections-. N.p., n.d. Web. 5 Dec. 2015. “Social Realism.” Social Realism. N.p., n.d. Web. 7 Dec. 2015. “Shepard Fairey – Campaign Stops Blog – The New York Times.” Campaign Stops Shepard Fairey Tag. N.p., n.d. Web. 7 Dec. 2015. “The Living Room Candidate – Commercials – 2008 – Yes We Can (Web).” The Living Room Candidate – Commercials – 2008 – Yes We Can (Web). N.p., n.d. Web. 5 Dec. 2015.